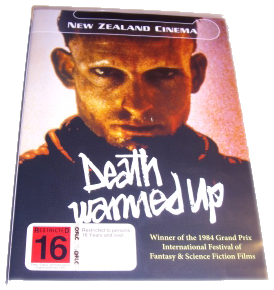 DEATH WARMED UP is available on DVD. 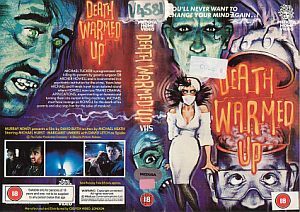 David Blyth's classic horror film Death Warmed Up is coming back to life, watch for an American DVD release of DEATH WARMED UP is coming soon! 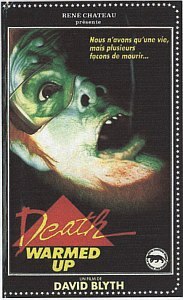 You can usually get the VHS from our Amazon links below which are now genuinely hard to find. 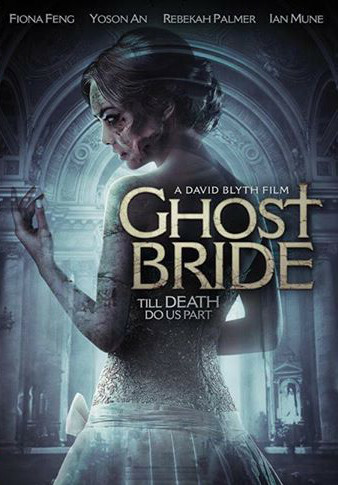 A hugely successful film with international multilanguage releases, it had many different covers. Here are a selection of some of our favourites. The blood shines on the menacing face of the Red Edition. What other editions were there? 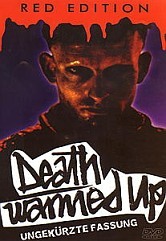 Death Warmed Up was a very popular film in Japan, called My-Doku. Thoughtful operation or was this a combination of Brian Dead and The Thinker? Legendary film director Alejandro Jodorowsky was on the French festival jury that awarded Death Warmed Up - you can read what he had to say about David Blyth here. Who is the actor featured on the French/USA cover? email me your answer. Have you an old cover of Death Warmed Up? If you email your cover of Death Warmed Up we can add it to this little collection.